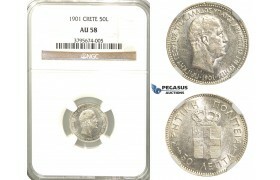 AA236, Crete (Greece) Prince George, 1 Lepton 1900-A, Paris, NGC MS65BN, Pop 1/0, Finest! Rare! 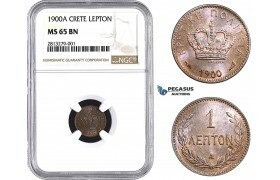 AA236, Crete (Greece) Prince George, 1 Lepton 1900-A, Paris, NGC MS65BN, Pop 1/0, Finest! Rare! 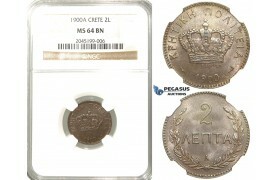 ..
R212, Crete, Prince George, 2 Lepta 1900-A, Paris, NGC MS64BN ..
R35, Crete, Prince George, 50 Lepta 1901, Paris, Silver, NGC AU58 ..